With a very rustic and classic look, the Hartwood 7′ x 5′ FSC Premium Overlap Pent Shed is one of the more impressive mid sized sheds that you can get. It has a very attractive look that makes this resemble a cabin you would find deep in the woods. It has a generous amount of storage space not just on the floor, but also in its height as well so adding shelving would greatly increase your storage options. The front of the shed has a very outgoing personality with that lovely looking door and two good sized windows that will ensure the shed is filled with natural light. The shed is very well made and that starts right at the bottom with its incredibly strong square boarded floor that is able to take lots and lots of weight. For the cladding they have gone for some very eye catching, 8 mm thick overlap cladding which is watertight thanks to the way it has been made. The whole shed is kept strong and secure thanks to a well made and robust frame. On the top of the shed is a pent roof that is not going to allow any water in the shed and as it slopes to the back the rain will always run away from the front of the shed. 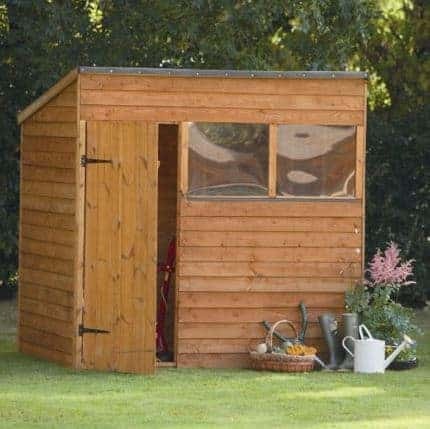 For those of you who have some pretty serious, heavy and rather expensive items like some top of the line gardening items or some heavy power tools, the Hartwood 7′ x 5′ FSC Premium Overlap Pent Shed would be a great shed for you. Before we get all technical, let’s just take a moment to talk about how awesome this shed looks. They have gone for a really classic look for this shed and we feel that it works wonderfully well. It kind of resembles something you imagine a lumberjack would keep all their saws, chains and other gear inside. While not large, this shed is slightly bigger than most of the other smaller sized sheds. The width inside the shed is 6 feet 10 inches and the depth 5 feet 3 inches so that is more than enough floor space for most people. The floor space is generous, but there is also quite a bit of height to make use of as well. At the back of the shed the height is 5 feet 9 inches, and the front of the shed is a very impressive 6 feet 11 inches, so when you step into this shed for the first time you are going to be blown away at the height this offers. The pent roof is why you have so much headroom inside the shed, but as well as making sure it is comfortable on the inside. This roof also ensures that the rains stays on the outside. The roof is made with solid sheet boarding and on top of this is green mineral felt which by the way we must say looks very smart. The way the roof slopes to the back is something we must applaud the designers for as it will keep the rain from running down the front of the shed. The shed gets its charm from the overlap cladding they have used. We think that it is the rough cut of this cladding that makes it look so rustic. The cladding is an impressive 8 mm thick so it can take quite a bit of abuse over the years. The way this cladding is put together really is quite amazing as it offers no little gaps or spaces for water to get into the shed. We really like the frame that they have used for this shed. While the cladding is great it cannot keep the shed standing strong on its own so we are very happy with the 28 mm x 28 mm frame that they have put inside here. This is a frame that is very well made and will give the shed a very robust feel to it. It is the floor that makes this a shed which is ideal for those of you who have a whole bunch of heavy items that you want to store. Rather than use the same kind of solid sheet boarding that they have used for the roof, there is a square boarded floor inside the shed. This really is one very impressively strong floor that can take just a crazy amount of weight. The floor is so strong that you could get a few friends round, a banjo, a jug and have yourselves quite the little barn dance. Sure it may be overly cramped if you do, but the floor could happily take all that weight. We really do like the Hartwood 7′ x 5′ FSC Premium Overlap Pent Shed, but we do feel that as this is a premium shed that they could have used pressure treated wood for the construction. Instead the wood will be giving a surface treatment at the factory which will only give it a short term protection so you will have to give it a good coating of wood treatment shortly after you have installed it. In order to keep the wood free from rot a fresh coating of wood should be applied once a year. If you do keep up with treating the shed on a regular basis then you will be guaranteed for ten years that the shed will stay free from rot. At 5 feet 9 inches high and 2 feet 2 inches wide, considering this is a single door, you have quite a bit of room to manoeuvre things inside the shed. On the front of the door one of the first things that catches your eye is those black hinges. As well as looking nice, these hinges are also very strong and will keep that door where it should be. On the back of the door are some strong braces that will stop the door from feeling flimsy. The two windows that are on the front of the shed are made with 1.25 mm thick, anti shatter styrene which is a material that we really like as if you have children it means that they cannot smash the windows with a ball, truck or whatever they are throwing around the garden. A pad bolt is used to keep the door closed and that gets two big thumbs up from us. While they have not included a way to lock the door, a pad bolt in our opinion is the next best thing. The whole shed does actually have a very secure look and feel to it so you will feel confident storing your things inside here. We really do like how those windows will let in plenty of light to the shed, but if you do want to keep your stuff out of sight then you will want to add something to cover up those windows. You could use some blinds, but if you wanted something cheap and cheerful then we feel a bit of fabric would do the job. The shed does not offer any customisation options, but you could always use coloured wood treatment. 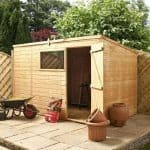 This is something we know that many people will do as it will allow them to protect the wood from rot and also give the shed a bit of personality. The pad bolt that is on the door is something we really like, but if you have something that is just so awesome stored in your shed that it keeps you up at night worried someone might try and make off with it, then you may want to consider purchasing the Yale Hasp Steel Black Finish 120 mm & Brass 40 mm Padlock set that they have. This does cost £19.99, but it is worth it if you are storing things that are expensive. For a price of £119.99 they also have a plastic shed base that can be helpful if you plan on installing the shed on grass. 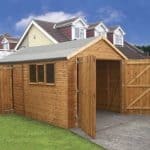 This is classed as a premium shed and the main reason for that is the strong floor, but actually in general we are very pleased with this shed and consider it to be of a high quality all throughout. 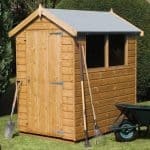 Sure the shed does need a little bit of TLC from you, but this is something that is going to help not just keep the shed looking great, but also ensure you are going to be able to use it for many years. The materials used for this shed are easily going to last well over 20 years and that is something we think is just fantastic. 7 X 5 is a very decent amount of space for most people and if you do want to maximise the space then you can do this with some smart item placement and some shelving. You will need to get someone to help as this can be a little awkward in places, but it is never overly difficult. Following the instructions and taking the odd coffee and cake break will make this a fun and stress free process. They do have similar spec sheds, but this one is worth the little bit extra money thanks to that very strong floor, especially if you have heavy items that you need to store. 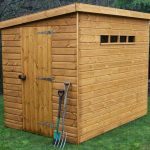 Final Thoughts: This is a shed that is very well made and in general we must say that we are impressed with what the Hartwood 7' x 5' FSC Premium Overlap Pent Shed is offering. 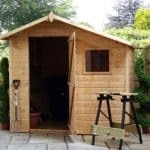 The main attraction and selling point of this shed is of course that solid floor which if you do have heavy items does make this a shed that would be perfect for you. 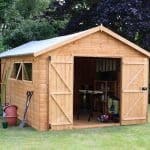 However even for just general storage of things like bikes, gardening tools and other not so heavy items, this shed is a decent size and will take care of your storage needs. All in all, this is one very well made shed and something we are sure you will not be disappointed with.